A £1.2m robot surgeon, bought for a Derby hospital by an online game tycoon, has begun work on patients. Mel Morris, 58, from Derbyshire, made his fortune from the Candy Crush game. The da Vinci device has cameras and robotic arms, controlled by surgeons, which allows them to conduct intricate operations. Mr Morris said he hoped it would help the Royal Derby Hospital in the long term, while patient Mick Barton said he was up and about within hours. The da Vinci not only allows the surgeon to make tiny and precise movements but also only requires small incisions through the skin, speeding up recovery times. Mr Morris is non-executive chairman of King Digital Entertainment, which has been valued at more than £2bn. 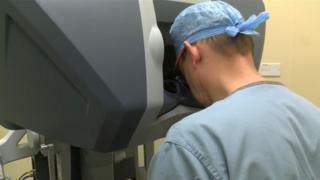 He said: "I had wanted to help and it was a conversation with a surgeon that raised the idea of a robotic surgeon. "I wanted to do something for the community and this helps a lot of people and helps the hospital maintain its profile." Stephen Thomas, consultant surgeon, said: "It allows complex major surgery to be performed with greater accuracy, with 3D vision and, hopefully, this translates to better surgical and functional outcomes for patients." Mr Barton admitted he was "daunted" at being the first to undergo the procedure in Derby. He said: "But someone had to be first, so let it be me. And it went really well - I was home within three days and I was up and active, to be honest, the day after surgery. "I had five incisions on my stomach, about the size of a drawing pin, no stitches. My brother had a similar operation but with more invasive surgery and his recovery took a lot longer."